Getting rid of unwanted hair is an age-old issue, with long-term hair removal being particularly challenging. The award-winning Soprano ICE laser hair removal system uses ground-breaking technology to offer a safe, simple, and truly effective hair removal method. Soprano ICE Laser Hair Removal works by gradually heating the dermis to a temperature that effectively damages the hair follicles and prevents re-growth, while avoiding injury to the surrounding tissue i.e. burns and is virtually pain-free. At VEGA Clinic we use the world-renowned Soprano ICE which is used in some of the top clinics worldwide including Harrods in Knightsbridge and Nazarian Plastic Surgery Clinic in Beverly Hills. As a clinic that specializes in permanent hair removal/reduction treatments, we make sure that all our laser and electrolysis treatments are carried out by aesthetic practitioners with at least “level 4 diplomas in laser treatments”. This is to ensure the full safety and efficiency of treatments. How do I know it's the right laser? Soprano ICE by ALMA Lasers is manufactured and designed in the US, this makes it one of the very few quality and most trusted machines in the laser hair removal market. The Soprano ICE is among the top 5 medical grade laser hair removal machines worldwide, for this reason the Soprano ICE has been awarded the winner of “The Aesthetic Industry Awards” several times. The quality of the machine is just as important as the type of laser which is why here at VEGA Clinic we make sure to be completely transparent about what products and machines we use. The treatment incorporates multiple laser wavelengths to treat all hair and skin types quickly and painlessly. Soprano ICE uses Alma Laser’s SHR method, which is the only clinically proven method of laser hair removal that is virtually painless. The unique heating and energy delivery method effectively damages the hair follicle while preventing injury and pain to the surrounding tissue. At the same time, integrated ICE tech cools the skin surface, preventing superficial burns and the sensation of pain. While pain tolerance is an individual matter, most people find the Soprano Ice completely Pain Free. The Soprano Ice ‘In-Motion’ treatment enables the treatment to be customized to the client’s tolerance ensuring advantages that other treatments cannot provide. The skin of some clients may become red immediately after treatment, this is rare however. This is a normal reaction that will subside within 24 to 48 hours. 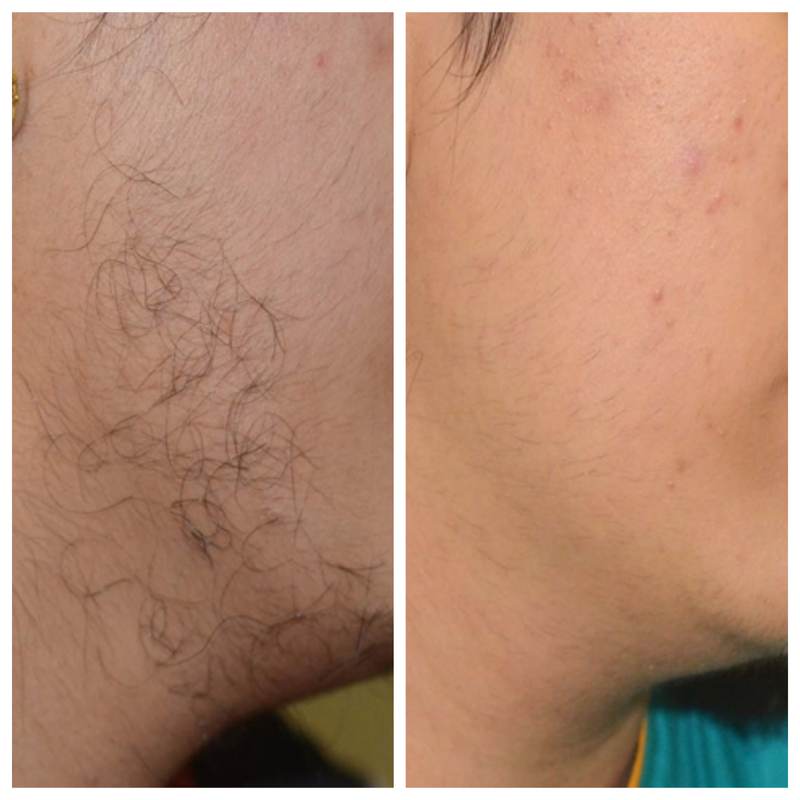 Laser hair removal works effectively for people who have pigmented hair. It is not suitable for people with blonde, ginger or grey hairs as they lack the pigmentation required to make this treatment effective. We advise clients with blonde, ginger or grey hairs to consider our electrolysis permanent hair removal treatments. The treatment incorporates multiple laser wavelengths to treat all hair and skin types quickly and painlessly. It can be used safely on all skin colours and sun-tanned skin. The exact time is determined by the size of the area being treated. For example, underarms would take approximately 15 mins, Full legs 30-45 mins and Full Back 30 mins. The Soprano Laser quickly and effectively treats multiple hair follicles at once with no down time, enabling clients to resume their normal activities immediately after treatment. 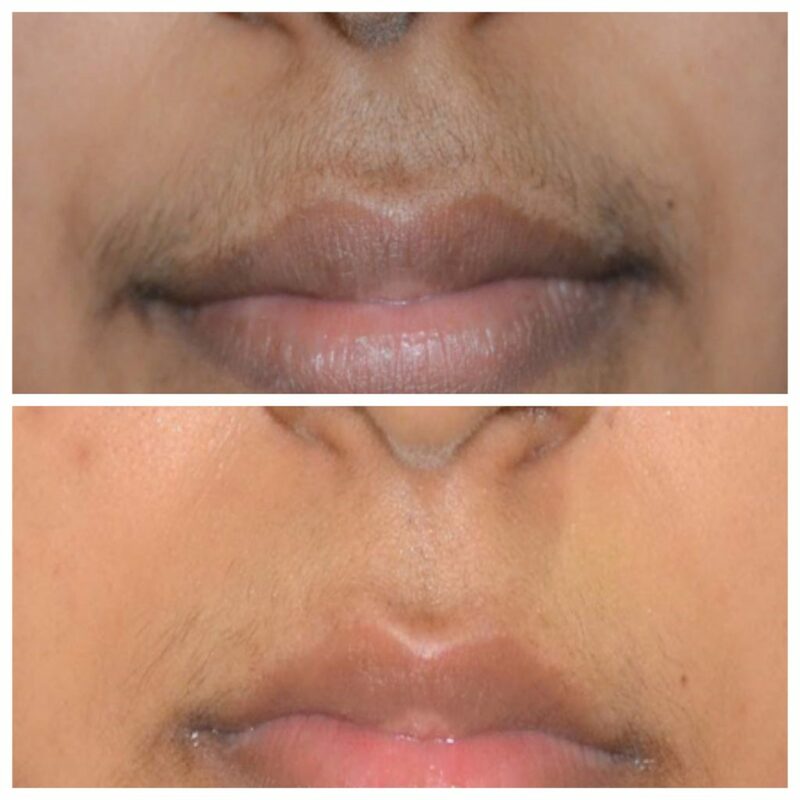 Best of all, this non-invasive, effective approach yields permanent hair reduction and long-term hair removal depending on desired results of the individual. For silky smooth and beautiful hair-free skin please contact us to arrange a consultation and patch test which will be carried out at least 24hrs prior to any laser treatment commencing. How is painless laser hair removal possible? Just like your iPhone, laser technology has greatly evolved. At VEGA Clinic we only use superior laser platforms that perform truly comfortable laser hair removal with the same, or better efficacy, all without the tears, hassle and numbing cream of the past outdated technology. Inferior lasers shoot energy that is so intense, that it not only causes pain, but it provides unnecessary risk & potential damage to the skin of the treated areas. With these lasers, the energy is generally turned down to prevent pain, at the sacrifice of results-this causes customers to need more treatments because the treatments are not effectively destroying hairs. This is not the case with our lasers. Using Soprano by Alma Lasers, the treated areas will have the laser head pass back and forth multiple times, to provide controlled laser rays to target, and kill off, unwanted hair. 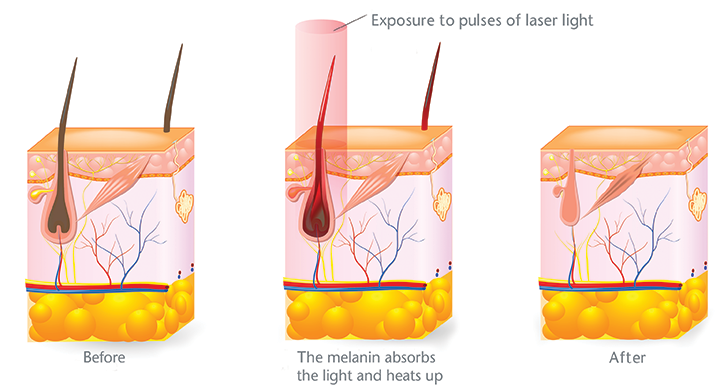 These laser rays essentially cook off the hair follicle to a point of destruction, all without damage to the skin. The resulting damage to the hair follicles reduces the body’s ability to grow and hold hair in the treated area(s). Doesn’t the lack of pain mean worse results? As long as unwanted hairs are targeted with laser rays, the follicle will be cooked off. In fact, our painless lasers are superior to traditional lasers and new non-painful lasers. How can our painless laser hair removal be more effective? Because our laser overlaps the treated areas at minimum 20 times per each treatment, more laser energy is delivered, thus, allowing more time for hairs to be “cooked” off and targeted to destruction. The average person who wishes to do laser hair removal is recommended a base of 6 sessions in the same treatment area. With each treatment, a small percentage of hair will reduce, or become finer in texture. Generally, after 6 sessions the treated area should see about 80% reduction in hair *some exclusions apply. Remember, laser treatments targets current, active hairs. While your body is responsible for repairing all damaged cells in your body, including hair cells, your body may repair damaged hair follicles post laser hair removal treatments, thus requiring more treatments. What if I have super thick hair? How many laser treatments will I need? Those with thick, dense hair may need 10 or more sessions. For example, men’s beard will almost always need 10+ sessions, with continued maintenance treatments. Teens may always require 10+ sessions. Those with active hormones may also need 10+ sessions with continued maintenance treatments. Women who become pregnant post treatment may require a new set of treatments. Those with ethnic backgrounds that have a propensity for more hair growth through the body may need 10+ sessions. Is there downtime after I have laser hair removal? Not with our lasers! You can return to work, travel or workout post-treatment. Will I need numbing cream for my laser hair removal treatment? Not with our lasers! While other laser clinics charge for numbing cream, with us there is NO NEED for numbing cream. Treatments are comfortable, while highly effective because of our time-tested treatment settings and protocols and superior lasers. When should I schedule my laser hair removal treatments? The first step before a laser hair removal treatment is a full consultation to identify your needs and examine your individual skin and hair. During this time a treatment plan will be devised with expected results, associated risks and downtime. We maintain our excellence by keeping at the forefront of the evolving medical and aesthetic industries. We effectively deliver our services and treatments at an affordable price without ever compromising quality or safety. If you have any other questions regarding the Soprano ICE laser hair removal provided at VEGA Clinic please give get in touch.